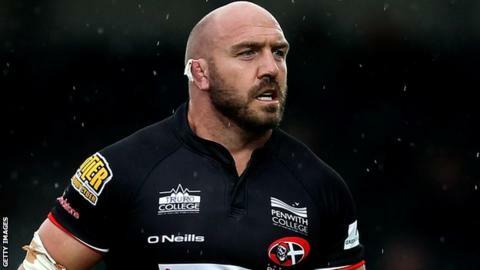 Cornish Pirates prop Alan Paver says he enjoyed his first taste of coaching the side in their 48-36 loss at Bedford. "You get a lot of nerves on the sidelines and I'm not used to that," Paver told BBC Radio Cornwall. "You shout a bit more, but on the whole it was a lovely experience for me," the 36-year-old continued. The Pirates led 17-14 early in the second half, thanks to tries from Tom Hendrickson, Max Bodilly and Tom Duncan, before Bedford scored five unanswered touchdowns in a 19-minute spell in the second half, which coincided with a yellow card for Tom Kessell. Duncan reduced the arrears with a second try and Craig Holland also scored to secure the Pirates a losing bonus point. "We had a fantastic start, but in the end the team that played most consistently was Bedford and they deserved their victory, but we showed really good things in parts," added Paver. "We thought we we really in it, we had a fantastic start after half time, but we just ran out of puff and when we had that sin bin they punished us .